It’s a pretty normal evening in District 4, Ho Chi Minh City, as my friend and I sit down to enjoy some ech va com (frog and rice), when suddenly the power goes out. Rather than flinch, I think, oh well, just another black out in the city. Earlier that evening, I got to my destination at around 9:00 pm. I was driving down Doan Van Bo in District 4 to meet a friend. This particular street was very narrow but still teeming with activity. People were eating on stools on non-existent paths. Babies with undies around their ankles urinated onto the road. Men drank beers jovially among friends and the air was alive with culinary smells. Next second, the whole power went out on a section of the street. There was a large cheer and then life continued on. It is not uncommon to witness a blackout in Ho Chi Minh City. So common are they that families usually have backup generators, candles and even hand fans in case one should strike. Nor is it uncommon to drive down a road and see one side lit and the other in darkness if the opposing sides are in different wards. Though no one really prefers power shortages, it has become somewhat part of the norm. Students even greet them with cheers at certain parts of the day as it would mean that a lesson would be cancelled much like how schools in England and Ireland might be cancelled on a heavy snow day. Myself, I have experienced maybe ten or more in the one and a half years I have been here. The first few may have surprised me, even scared me a little. Yet, I had always found them to be more mystical than terrifying. Before my current home, I had been living on the 4th floor of an apartment in Binh Thanh District and it was quite amazing to look out the window and see a whole city block black in the darkness of night. Yet looking out from on high and eating on a packed street are two very different experiences. To get an idea of the frequency of blackouts in Ho Chi Minh City, one should look at something called SAIDI, or System Average Interruption Duration Index. Basically this is an estimation of how much a citizen in a country experiences an electricity interruption. For example, most European countries experience less than 200 minutes of interruptions per year (see CEER report 2016) in comparison to Sub-Saharan Africa who experienced over 750 hours on average over 2015 and 2016, (Electricity Tariffs, Power Outages and Firm Performance: A Comparative Analysis Jean Arlet Global Indicators Group, Development Economics. The World Bank). 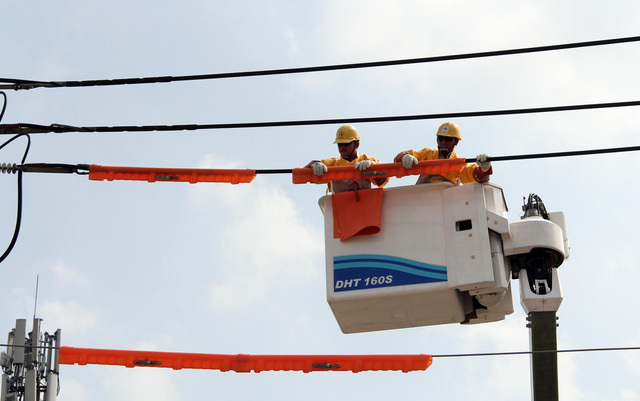 According to a report done by EVN (Vietnam Electricity), Vietnam experienced around 543.28 minutes in 2018, making the country rank 64th in the world power interruption index, an increase of 32 notches from 2015. That roughly translates as nine hours of power interruption per person, per year. It may not seem like much and this figure does not represent the many people who live in villages with no power at all. Normally it may not have huge ramifications, unless one is in the middle of doing some sort of electronic business and suddenly the Internet cuts out. There are many attributing factors to why the power shorts out. It has been said that the city could be described as the place of sun and dust. If one drives to any district of the city, construction can be seen there. From the numerous skyscrapers shooting up in District 1 or the high-rise apartments in District 2 to the factories being erected in District 9 or simply street maintenance that seems endless. If there is construction to be seen, then there are likely to be power cuts. This may be due in part to the operators of said work. I am not so bold as to blame them as it is quite obvious that they are limited to the tools that they have which are quite outdated and run-down. And because Ho Chi Minh City never rests, these laymen are under orders to work fast, finish faster and get out. Unlike the West, they are given a shoestring budget to do all this. In hindsight, cutting corners and rushed work are inevitably going to lead to power shortages and other problems. But that is part and parcel of the city. Of course, we should strive to do things better and provide services to each as we would want the services provided to us. Yet, accepting the inalienable truth that this is part of Ho Chi Minh City life will make living here less frustrating. To go even further, embracing it like the locals do might actually make you enjoy it that bit more. Doing exactly that, I embraced the power outage in District 4. Along with all the other restaurant patrons. Because when there is nothing that can be done about something, you can either complain or look on the bright side (pun intended). I am sure if I was unfortunate enough to live in regions with no power I would have a very different attitude. However, in the absence of such circumstances, in the romance of a meal in a dimly lit food stall, in the midst of people in joyous spirits, what's an hour or two in the dark?